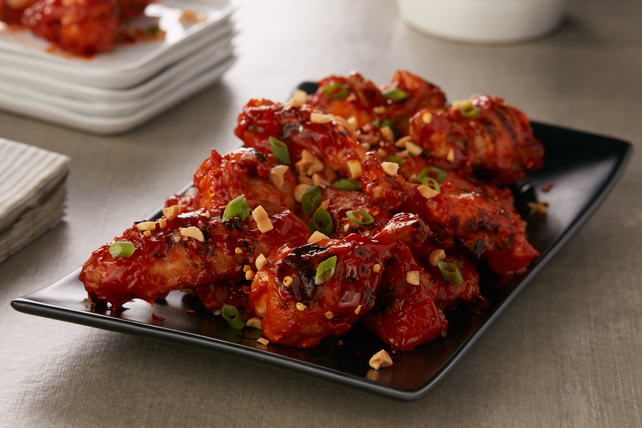 Tossed with a spicy sauce, then grilled to perfection, our Kung Pao Chicken Wings are better than takeout. Mix first 4 ingredients until blended; pour over wings in shallow dish. Turn to even coat both sides of wings. Refrigerate 30 min. to marinate. Heat barbecue to medium-high heat. Remove wings from marinade; discard marinade. Grill wings 15 to 20 min. or until done, turning occasionally. Place wings in large bowl. Add ketchup; toss until wings are evenly coated. Place wings on platter; top with remaining ingredients. Serve as an appetizer, or as part of your dinner along with some simple sides, such as hot cooked long-grain rice and steamed fresh broccoli.